I'm taking a back seat today, and letting Emma Websdale of the Royal Society Of Wildlife Trusts tell us about Wildlife Watch--a great club to get the kids involved in nature and the environment this summer! 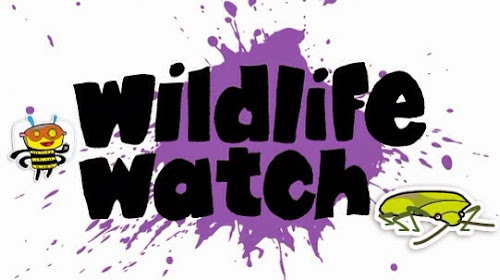 Wildlife Watch, the junior branch of The Wildlife Trusts, is the UK’s leading environmental action club for kids. With fun and educational groups and activities, Wildlife Watch encourages children to explore and connect with their local nature. There are more than 150,000 Wildlife Watch members around the UK (and the Isle of Man and Alderney too), many of whom take part in local Watch groups and events. 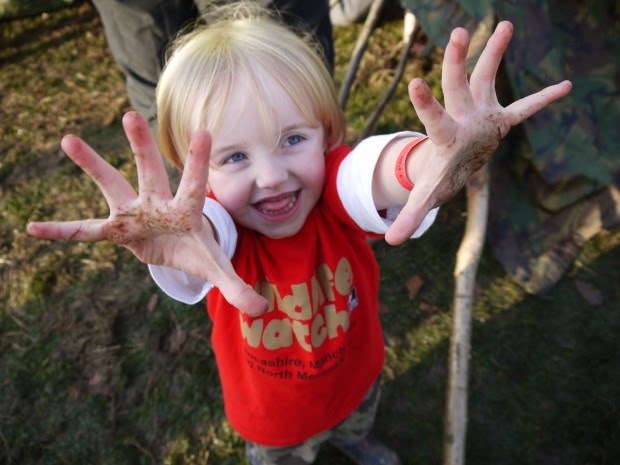 Organised by volunteer leaders who are passionate about their local places and wildlife, our Watch groups and events calendars full of family events motivate children to take part in various practical and environmental activities. So how are Wildlife Watch and Pier 32 connected? Whether it’s splashing about in muddy puddles, going on wildlife safaris, pond dipping, bat detecting, tree climbing or camping, our Wildlife Watchers need clothing that can withstand grass and mud stains. Brightly coloured and comfy to wear, Pier 32 have produced garments for Wildlife Watch since 2010, providing fun and suitable clothing for every Watch group’s activities and adventures: T-shirts and caps for those sunny days spent gardening and campfire cooking and sweatshirts and hoodies for nights spent surveying and star gazing. Interested in joining Wildlife Watch? 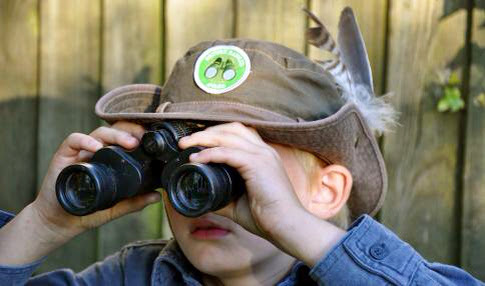 By joining Wildlife Watch you can truly become a nature detective! Not only can you take part in lots of fun and exciting activities, you can also make new friends and really get stuck into local wildlife conservation. Young people can subscribe to Wildlife Watch as junior members of their local Wildlife Trust. There are 47 Wildlife Trusts covering the whole of the UK. To join the Trust that matters most to you visit www.wildlifetrusts.org/your-local-trust. Thanks, Emma. Wildlife Watch use Pier32's range of kidswear by Gildan--sturdy enough to deal with anything your little animals throw at them! It's Fashion Revolution Day! Today, bloggers, activists and ethical fashionistas the world over are uniting under a common banner and a righteous cause. A year ago today the Rana Plaza disaster showed the world the true cost of cheap fashion; lives lost and ruined, workers exploited and put at risk in the name of profit. To mark the occasion, I'd like to repost a piece I wrote for Blog Action Day last year. I'd love to say that things have changed for the better, that the families of the victims have been compensated, that the Plaza has been cleared, that everyone touched by the disaster is able to mourn and move on with their lives. Sadly, that's not the case. Most of what I wrote in October is still relevant. That has to change, which is the main factor behind Fashion Revolution. Read more about what the day means, and what you can do to help prevent another Rana Plaza at the link under my piece. Let's make a change for the better. It's a terrible thing to note that one of the defining moments of the ethical fashion movement should be a tragedy. But that, sadly was the case in April of this year when a multi-storey building, the Rana Plaza, collapsed on the outskirts of Dhaka, the capital city of Bangladesh. That building was home to factories that stitched clothing for many big Western outlets. It was the workplace for thousands of garment workers, and it was a death-trap. Over a thousand people died when the building's foundations crumbled away to concrete dust. Mothers with families, and children, some as young as nine years old, all of whom worked crushingly long shifts to keep food on the table and a roof, however patched and leaking, over their heads. It was a humanitarian disaster, and all eyes were on both the owner of the building, and the fashion houses and supermarkets whose duty of care to their workforce had been so badly compromised. What happened next was shocking. Rather than admit culpability and offer compensation, many of the companies involved, including global heavy-hitters like Walmart and Gap insisted that they had nothing to do with the disaster. It was only when news footage of clothes labels in the rubble, clearly showing their names began to appear that their tone changed. That pressure led to coverage of the plight of the fashion worker in the Far East and India on an unprecedented level. Shows like the UK current affairs flagship Newsnight ran damning pieces on the disaster and its knock-on effects. Something had to change. The Bangladesh Fire And Safety Agreement, signed in July by many of the manufacturers with interests in the Rana Plaza, is the first government-backed accord to give factory workers in Dhaka and beyond, whose economy depends near-exclusively on fashion, more of a say in how their workplaces are run. Basic health and safety standards, including the banning of locked fire exits (a factor in many factory deaths) and agreements on better working hours and working conditions. Even now, though, some manufacturers are dragging their heels. Gap and Walmart refused to sign the BFSA, deciding instead to set up their own, internally-monitored programme. Many families are still waiting for any form of compensation. And changes taking place through the BFSA will take time to filter into the system. It felt like a victory for human rights in Bangladesh, but one that needed to be fought for every step of the way. In September, it happened again. The Aswad factory in Gazipur caught fire, trapping and killing several garment workers. There was a sudden, sickening sense of deja vu. A dangerously sub-standard building, missing or disabled safety features, an owner who didn't give a damn about the businesses he crammed into his high-rise. And worse, the same blithe denials from the multi-nationals at the heart of it all, the same meaningless statements of regret that only became apologies when their clothes were found draped in the wreckage. All the advances that had been made since Rana Plaza seemed to vanish like concrete dust in the wind. So, what can we do in the face of these seemingly insurmountable odds? We're working against a huge global industry that issues nothing but lip-service to human rights concerns. All that seems to concern them is the bottom line, and if that means out-sourcing work to contractors who run dangerously substandard buildings and fill them with underpaid, overworked, underaged workers with no rights, then, well, so be it. I'm not trying to paint them as moustache-twirling black-hats--running a global supply train is tough, and keeping it ethical even more so. But the abuses are there, and the worst bit is that when they're exposed nothing seems to happen to change it. If that notion horrifies you as much as it does me, then there is something you can do. You're a consumer with purchasing power, and access to the most powerful and integrated communications network that the world has ever seen. So use it. High Street companies don't like to be seen as slave-masters, and bad publicity is poisonous to the wholesome image they like to portray. Keep yourself informed, using bloggers and news sources like (ahem) this one, and make a noise when you hear about humans rights abuses like the one above. Stick something on Facebook. Tweet a link. Email a brand. Let them know that this can't go on. If Mothercare have sorted out their factories, then why aren't they shouting about it? Transparency is vital if we're to believe a global company when they say they've changed. The fight for an ethical fashion business is going to be a long one, with many more pitfalls and tragedies along the way. But it's a fight worth fighting, and persistance is all. The multi-nationals want us to give up and go away. Tough. We won't. Because what we want is simple. We want workers the world over, from Newcastle to Nairobi, from Dhaka to Darlington, to be treated with respect and concern for their well-being. We want them to be paid a fair wage. We want them to have a say in how the business they contribute their labour to is run. And we don't think a factory floor is any place for a nine-year-old. It's not much, in the great scheme of things. New figures show tha an extra 25p on the price of an item of cheap clothing would, if properly distributed, triple wages and ensure that factories are safe places to work. Can we seriously say that's a price we're not prepared to pay? Tomorrow is Fashion Revolution Day. To commemorate the loss of over 1,100 fashion workers in the disaster that still holds the town of Savar in Bangladesh, home to the Rana Plaza building that collapsed on 24th April last year in a tragic grip, a new documentary will be premiered at a charity screening in London. Tears In The Fabric features Razia Begum, who lost her daughters and son-in-law in Rana Plaza, and is now raising her two grandsons without financial support. The three are destitute, living in shelters and surviving on handouts, while waiting on the one thing that could make a difference: fair compensation. The message of the film is clear. The humanitarian crisis at Savar is still going on. The rubble has yet to be cleared--in one terrible scene Razia has to cross the remains of the factory to visit her daughters' graves. Hannan Majid and Richard York, co-directors of Tears In The Fabric, have spent years documenting the human rights abuses in the garment factories of Bangladesh. For them, the events of Rana Plaza were simply a horror story waiting to happen. "Even before Rana Plaza, there were fires and accidents all the time," Majid said. Meanwhile, York recalls the scene at the factory: "You can still see all the ripped clothing of the workers and the labels from the clothes they were making for UK brands." It seems almost unbelievable that a year after the disaster at Rana Plaza there are still questions about how much compensation is to be paid to those left behind. The companies who have a clear and obvious responsibility to the workers who died making their product are still either dragging their heels or are simply refusing to pay up. Although Primark has recently upped the amount it is paying into the compensation fund to £8million, and Mango has paid an undisclosed amount, brands like Walmart and Matalan are yet to drop a single penny into the pot, and there are fears that the first round of payments will not go out before the anniversary. Meanwhile, the money continues to roll into Bangladesh, unhindered by the bad publicity from Rana Plaza, and the fire at the Tazreen facility earlier in 2013 that killed over forty workers. $22 billion was made in export earnings in the first nine months of the fiscal year, and demand for Bangladeshi-sourced clothing remains high--it's the second highest producer of fast fashion after China. Tears In The Fabric is a film with a clear agenda and an intention to shock. We need to see that, a year after the events that shook the world of fashion, the families who have been torn apart are being ignored while huge profits are being made on the backs of their suffering. Tears In The Fabric premieres tomorrow night at the Raising For Rana event, hosted at Regents University in London. It will be free to stream and download on Fashion Revolution Day. Visit www.tearsinthefabric.com for the full scoop on that. With a week to go until Fashion Revolution Day, here's a short film by one of the co-founders of the movement, ethical fashionista Livia Firth. It spotlights the challenges faced by fashion workers worldwide and asks the question: what if we could connect with the people that make our clothes? Watch, enjoy, and join the Fashion Revolution. We all love jeans. They're one of those mainstays in our wardrobe that don't need to be regularly replaced (as long as we don't...outgrow them). In fact, one of the great things about jeans is the way that, as they get older, they look better and better. Much like your humble author. But there's a secret to giving your favourite pair of jeans that worn-in patina and look. And for many people, that secret would be a step too far. But it's a trick more of us could do with embracing, for a reason that's environmentally vital. "Buy a pair of organic jeans, never wash them and you wear them and wear them and wear them and they become like a second skin." Palle was wearing a pair of Nudies for the interview that he'd worn every day for at least two years. More and more big names in the denim world, including superstars like Tommy Hilfiger, are coming forward and saying that they too don't wash their jeans. Ok, let's deal with the argument that you're no doubt yelling at your computer screen right now. Over an 18-month period in 2010-2011, researchers at the University of Alberta found that jeans that had been washed and jeans that hadn't contained a similar level of bacteria. In other words, washing made little difference to the hygenic level of the garments. There's a more serious point to be made. The environmental impact of a pair of jeans actually increases after it's been brought home from the shops. Laundering creates the biggest carbon footprint in the life of the garment. Every time we stick our jeans in the washing machine, we're using large amounts of water and power, as well as flushing toxic detergents into the sewers. Kate Fletcher, Reader in Sustainable Fashion at the London College Of Fashion, has noted in a recent study that the energy needed to wash your clothes is about six times the amount needed to make it in the first place. This un-nerving fact brings us on to a very uncomfortable truth: it makes huge environmental sense to wash our clothes less and wear them more. The Nudie Jeans website is full of advice enabling you to wear that expensive pair of strides until they fall off you--a process that, with the repair service included, should take years. It's only in the last hundred or so years that we as a society have become used to big wardrobes and lots of choice in what we wear. That choice is having a huge impact on our planet, and the energy expended in caring for them is becoming a serious issue. The Huffington Post has come up with a few tips for those of us who are worried about odour, including hanging your garments outside, or sticking them in the freezer. Or, hey, you shower every day--why not go in fully dressed, and get two jobs out of the way at once? Kid's City is a charity that supports and supplies safe after-school play spaces for kids in the inner city. But even they couldn't have foreseen that their site in Brixton would get a little extra protection this week... from The Amazing Spider-man! Actor Andrew Garfield, in town for last night's premiere of the superhero sequel, dropped in on South London to say hi to the kids and volunteers of Kid's City. His visit included a fast-paced game of basketball in full web-slinging get-up, and a slap-up pizza lunch. The Pier32 connection to all this excitement? Well, we've been working with Kid's City since 2007, and when they found out with only a few days notice that Spidey would be swinging by, it was our turn to make a superhuman effort getting a fresh batch of their signature yellow t-shirts out to the charity on the tightest of turnarounds. The work paid off, and it was great to see the guys from Kid's City rocking their shirts on the red carpet! The Amazing Spider-man 2 is released in the UK on April 16th. On March 25th 1911, the Triangle Shirtwaist Factory, based in the Asch Building in New York went up in a blaze that would claim the lives of 146 garment workers. It was the worst disaster in the city's history until the terrorist attack on the World Trade Centre, nearly 90 years later. The deaths of these 123 women and 23 men was, in large part, down to the negligence and greed of the owners. The doors to the stairwells and exits had been locked to prevent pilferage and unauthorised breaks. Escape from the blaze was only possible by jumping out of the windows. The Triangle Shirtwaist Factory occupied the eighth, ninth and tenth floor of the Asch Building. That event marked a sea-change in workplace safety legislation, and sparked the rise of unionisation in the garment industry. The deaths of the Triangle Shirtwaist workers would ensure that their comrades would never have to suffer the same conditions that had led to their needless sacrifice. I'm not the first writer to compare the Triangle Shirtwaist fire to the collapse of the Rana Plaza building, but the parallels are inescapable, and history looks to be repeating itself. The deaths of the Rana Plaza seamstresses took place in a workplace culture where poor treatment and abuse of the workforce was commonplace. The building was substandard, and safety features were non-existent or unfit for purpose. Worst of all, the bankers and shop workers who shared the Rana Plaza were aware of its poor condition and had been evacuated days previously. The garment workers who died were told to go back to work or lose their jobs, on the morning that the Rana Plaza lost structural integrity and collapsed. Fortunately, in a mirror to events following the Triangle Shirtwaist fire, things are starting to change. The garment workers of Bangladesh are unionising, under new laws that allow them to do so without permission from their bosses. The Western companies whose collusion led to the conditions rife in the Indian garment industry are signing up to safety accords, and slowly paying out compensation. Thousands of factories are being independently assessed for both safety and worker treatment. The setup of staff participation programmes and anonymous telephone helplines is starting to put a little power into the hands of the people most responsible for the profits of the owners of the buildings and the multinationals that bring the work to them. It's also worth noting that the growth in cheap smartphones means that many workers are posting and tweeting about their own experiences. Most importantly, a global audience has become aware of the abuses carried out in the name of providing their cheap clothes. When even fashion bible Vogue finds room to talk about ethical fashion, you know that things have changed. As we approach the first anniversary of the disaster, fair-trade pioneer Carry Somers, writer Lucy Siegel and ethical fashionista Livia Firth are launching Fashion Revolution Day, a day of activism and information. We're urged to wear our clothes inside out, and to get curious about how they're made, who makes them and the conditions under which they work. 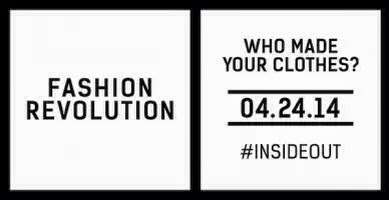 We'll be covering more on Fashion Revolution Day as we get closer to April 24th. For now, check the website, take a closer look at the clothes you wear, and join millions of people worldwide in helping to make sure that we never see anything like Rana Plaza or the Triangle Shirtwaist Fire again. 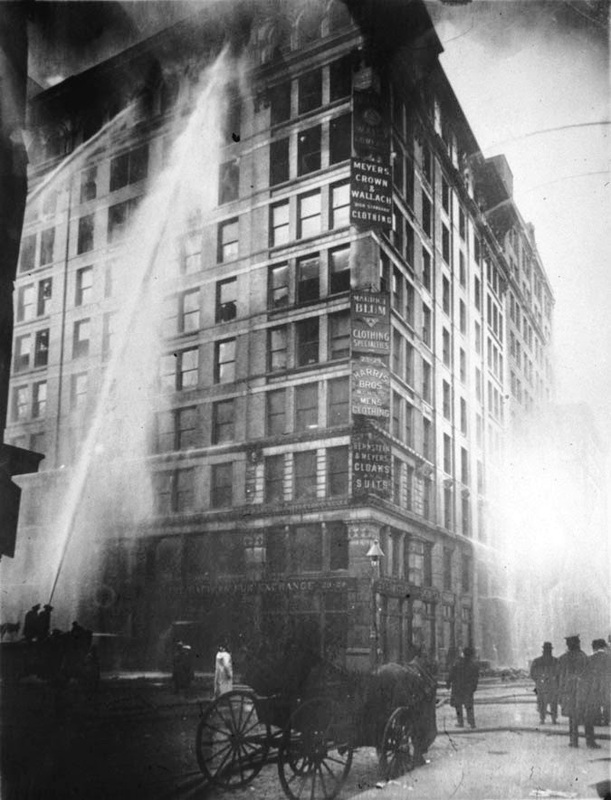 Find out more about the Triangle Shirtwaist fire on Wikipedia. The way we buy clothes is, it seems, logical and unchanging. You see an item of clothing you like. You buy said item. After a while, it starts to look tired or doesn't fit as well, so you get rid of it. Then you buy something else. The cycle continues, unbreakable. The problem with this model only becomes apparant when you look to the events pre and post the shop/wear/chuck roundelay. The creation of a piece of clothing is incredibly costly in terms of material, water use and chemical output to the environment. We put millions of pounds of perfectly useful fabric into landfill every year, for no reason other than the cost and bother in getting it split back into its constituant parts and recycled. Change has to come from somewhere. As ever, when it comes to innovation in ethical fashion, it's smart to start across the English Channel, and look at The Netherlands. Readers with long memories may remember that last year I wrote about Mud Jeans, a company that saw how hard-wearing, long-lasting denim could be used as a front-runner in a whole new business model: clothes leasing. You don't buy a pair of Mud Jeans. You rent them, paying, over the course of the term, about what you'd spend on a high-end pair. Over that period, any repairs needed are done as part of the agreement. At the end, you simply hand the jeans back and replace them with a fresh new set of strides. Mud take the old pair and break them back down to create new clothing. Don't forget, denim is incredibly hard-wearing. It can easily survive a good few go-arounds as more than one garment. It all seems counter to the way we'd normally buy clothes. When I wrote the initial article, I was less than enthusiastic. But the success of Mud has both proved me wrong and shows that when it comes to denim, the model makes a lot of sense. The material is built to last. I have a pair of Levi's in my drawer that I bought in San Francisco in 2005 that I still wear, and that still look good. We should also remember that the leasehold model Mud are using is hardly original. Just look at the continued presence on the High Street of suit hire shops like Moss Bros. In fact, the success of Mud Jeans has led to another Dutch company, DutchSpirit, applying their model to the ownership and maintainance of far-trade suits for the well dressed lowlander. The ethos is spreading, too. Swedish brand Nudie Jeans, who recently opened a flagship store in London's trendy Soho, have made a point of accentuating the recyclability of their clothing. A repair shop is front and centre in the showroom, and their website is full of tips on how to make your jeans last. When your trews are finally worn past your comfort zone, Nudie will take them back with a fat discount off a new pair. Your old jeans are recycled and resold as preloved in the same store. The focus is on keeping the denim out of landfill, and making sure it spends as long as possible where it belongs: hanging off your bum. "We want to make good quality, ethical jeans available to more people. We also want to keep hold of our valuable fibres and materials. To lease them rather than sell." I'm a great believer in buying clothes that last. It's always worth spending a little extra on quality goods, especially if you have a mind to making sure that investment is around for a long time. Mud and Nudie Jeans are taking that notion and redefining the idea of ownership, taking the stigma out of second-hand, and keeping control of the quality and recyclability of their clothes through the long life of the garment. It may seem radical, but in an era when clothes are becoming as disposable as the daily newspaper, a shift in our relationship to them isn't such a bad idea.